While there are electric tools available that can be used to split wood, some folks would much rather get the job done manually. There are two ways to manually split wood: you can either use an ax, or you can use a splitting wedge. Axes may suffice for smaller and softer pieces of wood, but when you’re dealing with large and harder pieces of wood, a splitting wedge is the solution. So, how can you find the best log splitting wedge for your needs? 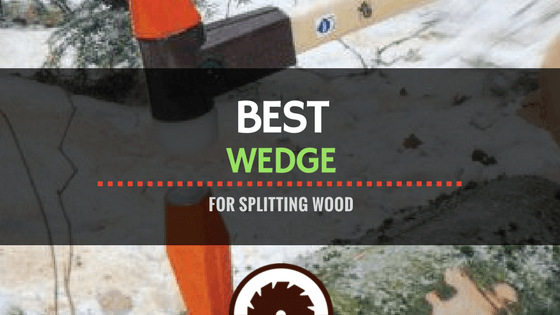 Well, this guide will not only provide you with the best wedge of 2019 for splitting wood, but will also tell you everything you need to know to find the right wedge for you. What is a Splitting Wedge? A splitting wedge is a small, but effective object which can be used to split large logs into smaller pieces. These small objects have been around for thousands of years, and have become more and more sophisticated as time passes by. By placing a splitting wedge on top of a log, it can be hammered down into the log in order to break said log into pieces. Wedges are made out of a variety of materials and come in various different shapes and designs. Common modern splitting wedge materials include steel, plastic, and other synthetic materials. While all splitting wedges serve the same general purpose, they are not all created the same. These wedges come in a variety of different shapes, designs, and styles. Some wedges are adorned with ridges, while others are smooth. There is no standard. The most common types of wedges are diamond wedges, twisted wedges, and spiral wedges. No wedge style or design is objectively any better than any other. Some people just prefer to use a diamond over a spiral, or a spiral over a twisted. For the most part, splitting a piece of wood with a splitting wedge is fairly simple. In order to do so, you’ll need a wedge as well as a hammer of some kind. For smaller logs, a small hammer will get the job done, but for larger logs, you’ll probably need to use a sledge hammer. Start by sitting your log straight up. If you’re splitting a thick log, it will likely be able to sit up by itself. But if you’re using a thin log, you’ll probably need to prop it up with something. If you need to prop up your log, you can do so by tying it to a larger log. This will stabilize it so that it can be split from its top. Once your log is sitting up straight, hammer your wedge just slightly into it. After the wedge is stabilized in the wood by itself, the fun begins. At this point, you will hammer the top of the wedge over and over again. As you drive the wedge further and further down into the wood, it will start to split the log apart. When you go to purchase a splitting wedge, you need to make sure that you aren’t just impulse buying. While they make look the same, not all splitting wedges are created equally. There are a number of things you must consider before making a final purchase. They include the wedge’s material, its size, its weight, and its design. Material: The vast majority of splitting wedges are made out of heavy-duty steel which is designed to take quite a beating. While there are plastic wedges available on the market, they aren’t even near as durable. Some wedges are also made out of a combination of plastic and steel. While these are more durable than just plain plastic wedges, they are still not ideal. Pure steel is the way to go. Size: Splitting wedges are available in all different sizes, some of which are designed to accommodate small logs, and others of which are designed to accommodate large logs. There is no set rule as to how big your wedge must for certain pieces of wood. Just use common sense. A small wedge is not going to be ultra-successful when used on huge pieces of wood. Weight: Another thing you must consider when purchasing a splitting wedge is its overall weight. Along with its shape and material, weight is a huge contributor to how functional a wedge is. Typically, the heavier a wedge is, the easier it is to drive through wood. But you don’t want to go too heavy. At some point, a wedge becomes so heavy that it starts to send shocks through the hammer. Think 10 pounds at the maximum. Design: Some wedges are designed with small ridges. Other wedges are designed to be completely smooth. Both designs can work, but typically a wedge with tiny ridges or bumps will be more successful. This is because said ridges will produce more leverage overall, allowing the wedge to drive through the wood with more ease. If you’re looking for a high-quality twisted splitting wedge, you might very well be interested in this one from Halder. Available for a midlevel price, it weighs in at 6.75 pounds, and measures in at around 10 inches in length. Made out of hardened steel, it possesses superb durability, capable of withstanding years and years of hard hammer strikes. Possessing a nice, flat, round strike surface, it’s as easy to make contact with as any wedge you’re going to find. Twisting at a 20-degree angle, this wedge is designed to turn as it’s hammered down into wood, allowing it to be driven with minimal effort. To allow it to be driven into wood smoothly without disturbance, it’s adorned with deep, smooth grooves. Looking for a solid, reliable, and affordable splitting wedge that quite simply gets the job done? If so, you might consider this Estwing splitting wedge. Available for a very reasonable price, it’s a no-frills wedge that quite simply serves the purpose of splitting wood. Weighing in at around 5 pounds and measuring in at around 9 inches in length, this wedge is made out of tough and durable hardened steel. With a flat, square striking surface, it’s relatively easy to connect with. Equipped with large, protruding, angled ridges, this wedge does a pretty standard job of driving through wood. It will cause stray debris, but will also drive through wood with general ease. For its price, it’s the best splitting wedge you’re going to find. If you’re looking for the best log splitting wedge on the market today, look no further than the Fiskars Rotary Gap Wedge. Though it’s certainly on the expensive side, it performs with more consistency and ease than any other wedge you’re going to find. Made out of forged steel, this Fiskars splitting wedge is not only highly functional, but endlessly durable as well. The striking surface of this wedge is made out of polyamide, a synthetic material that helps to reduce the amount of debris and wood chips that go flying. This will help to keep your eyes and body safe. Measuring in at around 10 inches in length, it weighs around 5 pounds. Designed with deep ridges and bit of a twisting pattern, it does a terrific job of turning and driving through wood. Though it’s expensive, this is the best wood splitting wedge around. Perhaps you’re interested in getting a diamond splitting wedge? If so, we recommend the Redneck Convent Diamond Wood Splitting Wedge. Measuring in at around 7 inches in length and weighing in at around 3.15 pounds, it’s not the largest wedge around, but serves its purpose just fine. Made out of hardened steel, this wedge is as tough and durable as they come, built to last for years and years of use. Designed with a huge strike surface, it’s almost impossible to miss. Due to its spiraled design, it’s capable of splitting wood into many different pieces at once. It is, however, a little more difficult to drive in than other wedges. This is due to its rather thick design. If you’re interested in purchasing a spiral splitting wedge, you might well be interested in this one from Timber Tuff. Measuring in at around 8.5 inches in length and weighing in at around 8 pounds, it’s a rather large wedge which does its job reliably for a reasonable price. It also features an automatic oiling system and a convenient oil level indicator to make things all the easier. Ergonomically, this beast comes equipt with an ergo-mesh grip that makes it feel like you are holding a baby. Moreover, the thumb safety button is easy to reach. This saw also features a full lineup of safety features, including low kickback, a triggered start, and a front hand shield. The 16 inch Oregon bar and chain is best utilized for small household tasks and woodcutting. Moderately priced and backed by both a 5-year warranty and a 2-year battery and charger warranty, this tool is a sound investment. There’s something about splitting wood with a wedge and a hammer that makes you feel more human; makes you feel more worthwhile. Fortunately, splitting wedges haven’t quite gone out of style yet. They’re still alive and thriving, with plenty of great, sophisticated models on the market today. The top splitting wedge on the market today is the Fiskars Rotary Gap Wedge 120 021 Safe-T. Made out of forged steel, this wedge is equipped with a large, round striking surface which allows for reduced splintering, and increased performance.